As I am packing my bags to leave for San Diego Comic Con (SDCC), I wanted to let you know what kind of coverage we will have for the fans of Outlander. I will be attending the Outlander panel on Saturday and am planning on live tweeting it. Save for any technical difficulties, this will all happen on our Twitter account, @OutlanderTVNews. The hashtag that will accompany the tweets is #OutlanderSDCC. While I am furiously typing with spelling errors and all, I won’t have time to post any photos during the panel. You can also follow Outlander Podcast on Twitter (@OutlanderPod). Ginger will be sitting alongside me for this endeavor and will be live tweeting as well. I will attempt to get the panel details and tweets up that night, but sleep may take priority. I will not be at the autograph signing after the panel because I am a huge fan of another show that has a panel after Outlander. If any Outlander-related merchandise or advertisements are seen, I will take a photo and spread it on Twitter and elsewhere. If you are at SDCC and see something, tweet it to me. All other Outlander news that comes out of SDCC including new interviews will be posted, but may be delayed because of the general busy-ness at SDCC. Stephanie will be writing up the interviews as well, but she has a full-time job and enjoys relaxing on her weekend. If anything, you might see a SDCC Master Post pop up on the site that will be updated as new interviews come online. We do have at least one special thing we get to do involving Outlander, so stay tuned. I am very excited about it. Last but not least, if you like our site’s banner, I have stickers featuring both of the Jamie and Claire drawings by girlfrog. I have a couple hundred at my disposal to give out to fans of the site. I will tweet a photo of myself (oh good lord) that day so you know what I look like. If you will not be at SDCC, you can purchase the stickers directly from StickerMule. 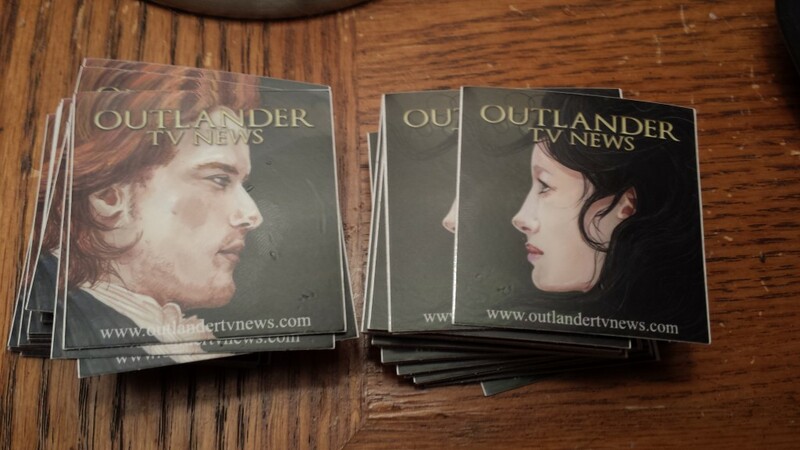 Click here to purchase the Jamie sticker and the Claire sticker. While there is no premiere screening this year, I hope you are excited about the coverage regardless if you are at SDCC. If you have any questions/comments, feel free to post here or tweet us. This entry was posted in SDCC, Website News and tagged SDCC, Website News by Sarah Ksiazek. Bookmark the permalink.